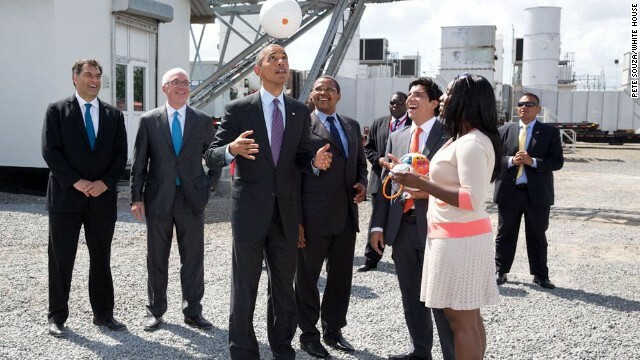 (CNN) - President Barack Obama couldn't leave Africa without kicking a soccer ball around. Traveling with President Jakaya Kikwete of Tanzania on Tuesday, Obama toured the Umbungo Symbion Power Plant, where they saw a demonstration of the power-generating "Soccket" ball. The soccer ball uses the kinetic energy from play to provide a source of renewable, off-grid power. It was invented by Unchartered Play co-founder Jessica Matthews, a dual citizen of Nigeria and the United States, Julia Silverman when the two were students at Harvard College. As Matthews explained how it works, Obama took a white Soccket ball, which has a plug on it for a power cord, and dropped it to his feet to kick it back up to his hands. Prodded by some cameraman that he can do better than that, the president then tossed it higher and head-butted the ball to himself, according to press pool reports. Obama walked over to the media to explain what he learned about the ball. "There is a mechanism inside so that the kinetic energy, when you kick the ball, creates a battery. So now you can power this," Obama said. With a cable, he connected the ball to a cell phone. "You can play with this for two hours and now you've got half an hour's worth of, an hour's worth–," Obama said, before someone familiar with the technology interjected. "Thirty minutes of play, several hours of battery," Matthews said. Later in a speech, the president said he thought the ball was "pretty cool." "The Soccket turns one of the most popular games in Africa into a source of electricity and progress. You can imagine this in villages all across the continent," he said. The president concludes his three-country trip to Africa when he departs later Tuesday to return to the U.S.
Wow, Soccket ball? That's a really awesome idea. As much as soccer is played in that country, remote villages can power themselves for a long time. Awesome! Yeah, the Soccket ball is cool too! lol! Someone needs to invent something to attach to the lower jawbone of some conservatives in this country so that we solve the energy crisis. With the way traffic is around NYC, I vent a lot at other drivers. If I had one, I could power an electric car! Just another cool piece of high-tech we won't see here because Legacy Energy has the politicians lined up in a row in its metaphorical suit-jacket pocket like Maduro cigars. Don't get me wrong, it's cool, but it's not something you'd really ever use unless you were in the 3rd world and cut off from the grid. I think the general idea will take off more in the future. Sooner or later you might be able to simply capture the kinetic energy from walking. Obama really represents us well on the world stage. That he is not afraid to show his human side and do things like this to relate to the people of the country he is visiting is a bonus. I used to cringe when our last POTUS went out on the world stage........not so with this one. Like the Segway, interesting, maybe cool, but useful, practical? No. Just more green energy rubbish that has no practical use. Donald – "Green energy rubbish"? Sunrises and sunsets must look interesting on your flat Earth, yes? Yeah, Putin and the Chinese enjoy making a fool of him on a regular basis. Great representation there. so how much energy in terms of oil, gas and electricity does it take to make one of these? my guess is much more than it will ever generate before being cast aside as totally useless. @it must be said..........I can cite a number of times that our previous POTUS embarrassed us on the world stage. Can you tell us what you are referring to when you say our current POTUS has been made a fool of by the Chinese and Putin?